Infinity Chloe Hybrid Mesh Avatar HUD Update!
! While I do not enjoy fighting crowds, I love searching online for some good deals. I’ve noticed that a couple of SL brands have also made Black Friday sales, so if you’re looking for a shopping fix, check them out! My Black Friday outfit is the new Bowie dress from Katat0nik in Black, and added some dark Black eyeliner on Chloe. If you’re a fan of the Infinity Chloe Hybrid Mesh Avatar from LOGO, you’ll be happy to know that there have been some updates! 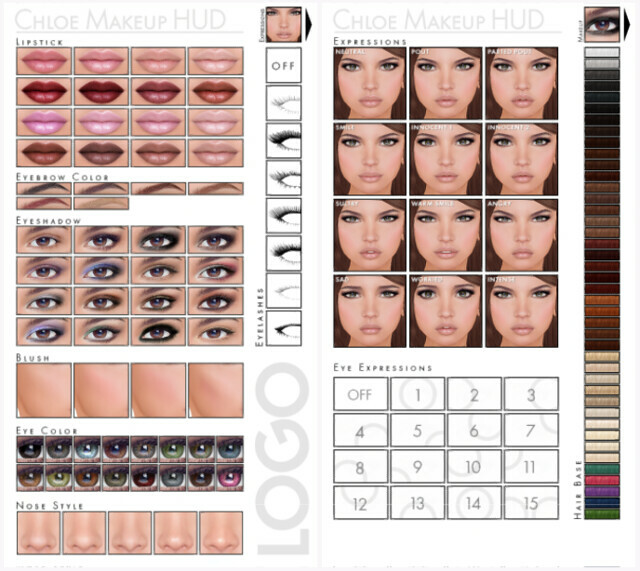 The Chloe v1.3 has hair base, redesigned eyes (to include eye positions), and rigged eyelashes & eyelids. Everyone who purchases Chloe now will have this included in the package, and if you did not receive an update yet, the updated package will be sent out manually. I don’t wear hair base often, but I think a lot of people will be happy with this new feature. The hair base matches LOGO’s own hair textures, but you can probably find a color that closely matches with other hair brands. Lovin’ this dress, you look gorgeous! I’m really happy to see this update! I think a hairbase is essential in making our hair look like its actually growing from our heads, instead of looking like a doll wearing a wig, particularly if you wear brunette or black shades. Also nice to know is that the teeth and eyes are not combined anymore. That means that you can wear your own mesh eyes. I like wearing FATEeyes instead of the Logo eyes that are included. I didn’t receive the update. I wrote Max & his partner but haven’t heard back yet. Like Angela, I can’t wait to be able to wear my FATEeyes with this! LOGO uses Caspervend, so you can go to any caspervendor and touch it for a link to a redelivery webpage – that will get you the updated version. Caspervend doesn’t seem to work for marketplace purchases. I’ve also notecarded the creator. I really love this mesh head and all the features. Incredible!